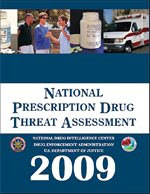 Current nonmedical use of these drugs, collectively referred to as "controlled prescription drugs (CPDs)" for the purposes of this report, remained relatively stable from 2003 (6.5 million) to 2007 (6.9 million); however, the number of deaths and treatment admissions involving CPDs, particularly prescription opioids, increased significantly. According to the Centers for Disease Control and Prevention (CDC) National Center for Health Statistics, unintentional overdose deaths involving prescription opioids increased 114 percent from 2001 (3,994) to 2005 (8,541), the most recent nationwide data available. Increases in legitimate distribution of prescription opioid pain relievers (the most commonly diverted and abused CPDs), amphetamine, and methylphenidate have expanded the amount of these drugs available for diversion and abuse. ...which will likely provide further impetus to the movements afoot to, in some way, further restrict legitimate prescribing of these drugs (cf here). I am skeptical this can be done in a way that will ensure timely access to these drugs for patients who responsibly use them and benefit from them, particularly those without cancer. If any policy-mavens reading this have ideas as to how this could actually be done well, feel free to share your thoughts on the blog. One interesting part of the report is a massive table listing street values of different prescription drugs - they are listed by drug & dose, as well as where the info was collected. E.g. 4 mg tabs of hydromorphone can go for up to $40; MS Contin's street value wasn't grossly less than OxyContin's overall. Thanks to Dr. David Weissman for alerting me to this.